The Pearl Fishers cast. 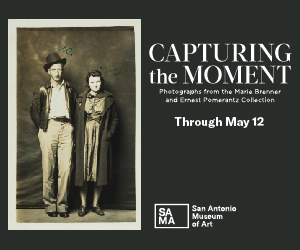 Photos by Lynn Lane. 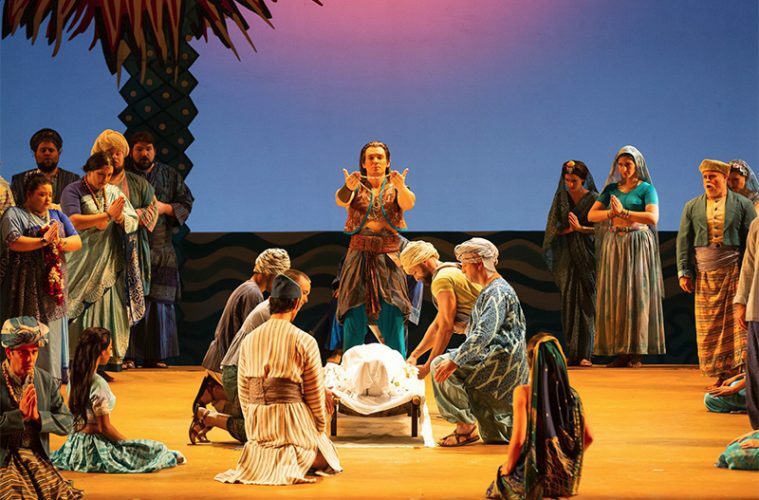 It was a night of many firsts at Houston Grand Opera’s production of French composer Georges Bizet’s The Pearl Fishers. Opening night marked the company’s first ever staging of young Bizet’s melody-rich love story, which has seen a red hot revival in recent years, thanks in large part to British fashion icon Zandra Rhodes’s vivid design for San Diego Opera’s production in 2004. Her sets and costumes took on a fresh look in the HGO production, with blazing colors everywhere. 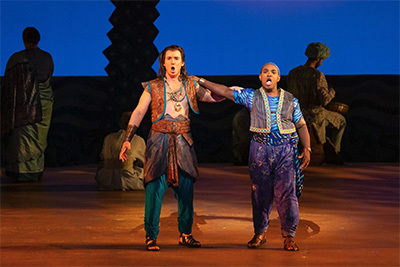 Alexander Birch Elliott as Zurga and Lawrence Brownlee as Nadir. Rising conductor Roderick Cox made an impressively assured opera conducting debut leading the HGO orchestra in Bizet’s beguiling score. His pacing was spot on, moving the action along with ease and suppleness. He allowed the singers to shine by accentuating the various color combinations of the lightly-textured orchestral palette, enveloping the scene with a sweetness characteristic of French music. The music was easy on the ears but never so relaxed as to lose vitality and drive. The orchestra was in fine form, shaping delightful melodies with natural expressiveness and luxuriating in the sensual colors. Tenor Lawrence Brownlee sang the role of Nadir for the first time in his already stellar career. While Nadir has a rather one dimensional persona, a fault of the libretto, Brownlee was able to give the character a flawless voice and a natural likeability. One of the foremost bel canto tenors on the scene today, his vibrant tone matched the youthful passion of his character. Lawrence Brownlee as Nadir and Alexander Birch Elliott as Zurga. Baritone Alexander Birch Elliott made an unexpected HGO debut in the role of Zurga, replacing Mariusz Kwiecien days before the opening. It was a deja vu of sorts for Elliott, as he had to fill the same role at the Metropolitan Opera last November, when Kwiecien fell ill after Act I. He was a dramatic presence on the stage, navigating a range of conflicting emotions with a generous voice that exuded fervent intensity. 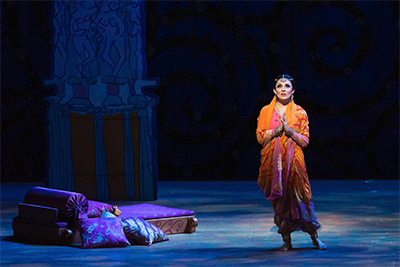 HGO Studio Alumnus Andrea Carroll sang the role of the priestess Leïla. Even among this stellar cast, she stood out as the most complete artist of the evening. Her voice was full of luster, her delivery clear and effortless. Coloratura passages gleamed above her warm and rich vocal ground. She projected power when called for, but it was the subtle shading of phrases and perfect control of tone color in the quietest moments that moved the heart. More than just a gorgeous voice, she was entirely empathetic with her character, expressing nuanced feelings with perfect conviction. 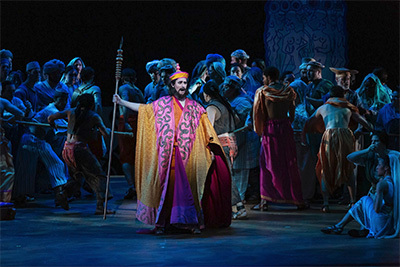 Federico de Michelis as Nourabad and the cast in The Pearl Fishers. The story of The Pearl Fishers revolves around a central love triangle, with an absurd pileup of coincidences providing melodramatic twists and turns along the way. Nadir and Zurga both love the priestess Leïla but chose to put loyalty to their friendship above that love. However, it doesn’t take much for Nadir to break his vow when Leïla turns up as the mysterious priestess sent to the village to protect the pearl harvest. When the lovers are caught by the high priest Nourabad, Zurga is faced with deep emotional turmoil in deciding their fate. He changes his mind more than once or twice, but in the end does the noble thing. The tenor gets the girl, but the baritone is the self-sacrificing hero. Every opera aficionado knows the famous bromance duet “Au fond du temple saint,” sung by Nadir and Zurga early in Act I. Brownlee and Elliott’s voices were beautifully balanced. They eschewed power and sentimentality for a more restrained display of superb vocal technique. If anything, they could have taken a bit more time to savor the gorgeous long lines. 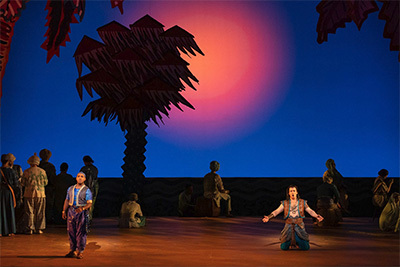 Under the brightly colored cut-out palm trees that inhabit the stage in Act I, Brownlee launched into the opera’s other greatest hits aria “Je crois entendre encore,” in which his passion for Leïla is reawakened by the mere sound of her voice. It was a straightforward delivery, bright and tight. Leïla’s prayer to the gods “Oh Dieu Brahma” was a singularly stunning moment this night. Carroll’s voice was as transparent and pure as the glistening stars she is singing about. She enveloped each exquisite turn of phrase with a soft glow from which coloratura passages danced like an array of shimmering bells. Throughout the evening, in both solos and duets, Carroll had the ability to project both power and delicacy. She took the time to delineate the contours of each line with intention and meaning. Elliott embodied Zurga’s emotional turmoil with heated intensity in Act III. Rage, regret, tenderness, passion, jealousy, hate, vengeance, forgiveness–he had the dramatic range to make it all believable. The final trio, with the lovers singing their love duet offstage while Zurga bids farewell to dreams of love and awaits his fate, was quite touching. As the flames rose on the fiery backdrop, the opera’s oft-criticized abrupt ending felt just right. Clearly, Bizet and his two French librettists knew nothing of ancient Ceylon (now Sri Lanka), where the story is set. They didn’t even get the religion right. Chalk that up to 19th century Orientalism and Exoticism, which HGO took the time to address in the program book. Zandra Rhodes created a visual delight in set and costume design with a feast of eye-popping colors. From the start the golden sand and azure sky, and the silhouette of three pearl fishers wielding long poles, set an alluring scene. The temple set in the second act was especially gorgeous. With help from artful light design by Mark McCullough, the ornate columns with stylized human figures came to life in three-dimensional perspective. 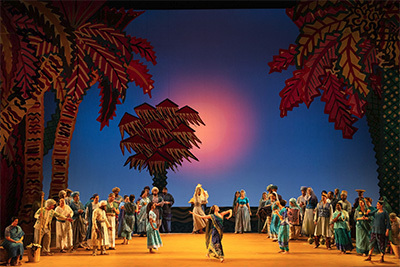 The chorus and dance elements were essential to the visual and musical landscape of the production. The HGO chorus was a tight ensemble that sculpted the mood of each scene with sensitivity. Eric Sean Fogel did an outstanding job with the choreography. Extended dance numbers were a brilliant synthesis of ballet and stylized Sri Lankan folk dance. The nine dancers were by turns ebullient and joyous, elegant and stylish, bestowing additional splendor on an already stunning evening at the opera.